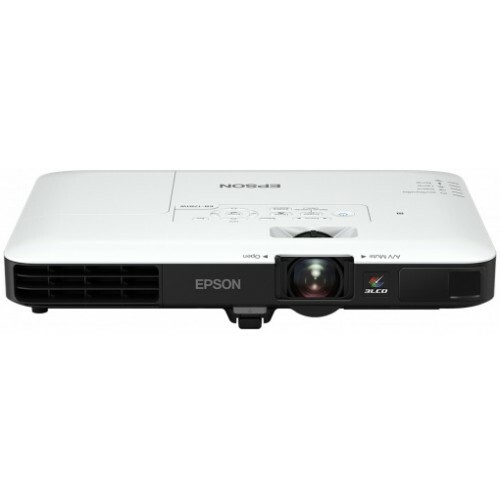 Epson 1781W with the brightness of 3200 lumens & having the resolution of 1280 x 800 WXGA 3LCD projector is well capable of creating an impact on entertainment & business presentation. The contrast ratio of 10,000:1 for 30-300 inches image on the screen can provide enough clarity & visibility from 1.35 m - 1.62 m distance. The lamp with 4,000-7,000 hours of durability requires only 214 W power. This RGB liquid crystal shutter projector ensures HDMI in, VGA in, USB 2.0 Type A, USB 2.0 Type B, Composite in, Stereo mini jack audio in, MHL, Near Field Communication (NFC) and wireless LAN IEEE 802.11b/g/n (2.4GHz) connectivity for compatibility. This white colored affordable device has a great portability with the light weight of 1.8 kg. Star Tech offers the best price in Rangpur, Dhaka, Chattagram, Sylhet & Khulna for the slim & mini projectors. Experience bright, high-quality images in the home or office with 01 year of warranty facility. Buy online and have the delivery inside Bangladesh.